Roaming Stamper: TGIF and a Color Challenge! Wow, it's Friday already. We stayed home this Spring Break for the first time in a very long time. We did a lot of yard work as we had beautiful weather and I'm thankful most of the big stuff is done. I host the color challenge over at Stampin' Addicts on Friday's and today's color challenge is: Pretty in Pink, Almost Amethyst, and Barely Banana. I wanted something spring like and thought those colors were perfect to usher in Spring with! 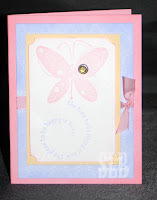 Here's my card and as always, all products from Stampin' Up! While I was doing some spring cleaning, I dusted off this set. Sometimes I get so involved with new sets that my older sets start getting neglected. This is a well loved set, I've used it tons but it had been sitting for quite awhile now. It was happy to come out of the box and play! Have a great weekend everyone and Happy Spring! !